During the reign of Sennacherib of Assyria, Babylonia was in a constant state of revolt, led by Mushezib-Marduk, and suppressed only by the complete destruction of the city of Babylon. In 689 BC, its walls, temples and palaces were razed, and the rubble was thrown into the Arakhtu, the canal bordering the earlier Babylon on the south. This act shocked the religious conscience of Mesopotamia; the subsequent murder of Sennacherib was held to be in expiation of it, and his successor Esarhaddon hastened to rebuild the old city, to receive there his crown, and make it his residence during part of the year. On his death, Babylonia was left to be governed by his elder son Shamash-shum-ukin, who eventually headed a revolt in 652 BC against his brother in Nineveh, Assurbanipal. The city of Babylon was reputedly surrounded by a wall 90mts high, 24mts wide, and 97kms in circumference. The wall was also buried 10mts into the soil in order to prevent enemies from burrowing into the city limits. Once again, Babylon was besieged by the Assyrians and starved into surrender. Assurbanipal purified the city and celebrated a "service of reconciliation", but did not venture to "take the hands" of Bel. In the subsequent overthrow of the Assyrian Empire, the Babylonians saw another example of divine vengeance. 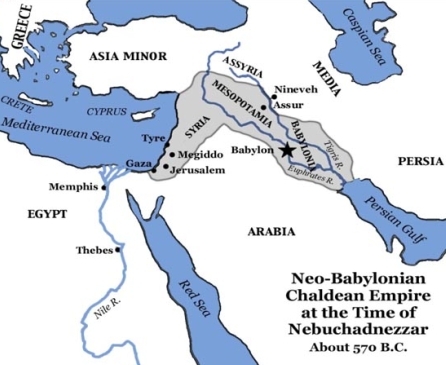 Under Nabopolassar, Babylon threw off the Assyrian rule in 626 BC, and became the capital of the Neo-Babylonian Empire. With the recovery of Babylonian independence, a new era of architectural activity ensued, and his son Nebuchadnezzar II (605 BC–562 BC) made Babylon into one of the wonders of the ancient world. Nebuchadnezzar ordered the complete reconstruction of the imperial grounds, including rebuilding the Etemenanki ziggurat and the construction of the Ishtar Gate — the most spectacular of eight gates that ringed the perimeter of Babylon. The Ishtar Gate survives today in the Pergamon Museum in Berlin. Nebuchadnezzar is also credited with the construction of the Hanging Gardens of Babylon (one of the seven wonders of the ancient world), said to have been built for his homesick wife Amyitis. Whether the gardens did exist is a matter of dispute. Although excavations by German archaeologist Robert Koldewey are thought to reveal its foundations, many historians disagree about the location, and some believe it may have been confused with gardens in Nineveh. In 539 BC the Neo-Babylonian Empire fell to Cyrus the Great, king of Persia. It is said that Cyrus walked through the gates of Babylon without encountering any resistance. He later issued a decree permitting the exiled Jews to return to their own land, and allowed their temple to be rebuilt. Under Cyrus and the subsequent Persian king Darius I, Babylon became the capital city of the 9th Satrapy (Babylonia in the south and Athura in the north), as well as a centre of learning and scientific advancement. In Achaemenid Persia, the ancient Babylonian arts of astronomy and mathematics were revitalised and flourished, and Babylonian scholars completed maps of constellations. The city was the administrative capital of the Persian Empire, the preeminent power of the then known world, and it played a vital part in the history of that region for over two centuries. Many important archaeological discoveries have been made that can provide a better understanding of that era. The early Persian kings had attempted to maintain the religious ceremonies of Marduk, but by the reign of Darius III, over-taxation and the strains of numerous wars led to a deterioration of Babylon's main shrines and canals, and the disintegration of the surrounding region. Despite three attempts at rebellion in 522 BC, 521 BC, and 482 BC, the land and city of Babylon remained solidly under Persian rule for two centuries, until Alexander the Great's entrance in 331 BC. In 331 BC, Darius III was defeated by the forces of the Macedonian ruler Alexander the Great at the Battle of Gaugamela, and in October, Babylon fell to the young conqueror. A native account of this invasion notes a ruling by Alexander not to enter the homes of its inhabitants. The constant turmoil virtually emptied the city of Babylon. A tablet dated 275 BC states that the inhabitants of Babylon were transported to Seleucia, where a palace was built, as well as a temple given the ancient name of E-Saggila. With this deportation, the history of Babylon comes practically to an end, though more than a century later, it was found that sacrifices were still performed in its old sanctuary. By 141 BC, when the Parthian Empire took over the region, Babylon was in complete desolation and obscurity.